When I took over the daycare pick up and drop offs with the girls, something hysterical happened. 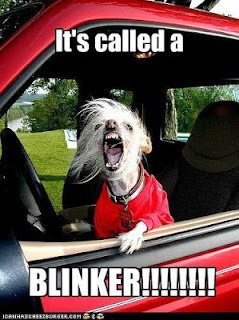 I inadvertently taught the girls road rage. Okay, not really. Because that wouldn't be funny. But they did make me realize how often I comment on traffic, and how maybe I should chill out a little. But mostly they just made me laugh. First, when traffic slowed but didn't stop, they started to yell, "MOVE CAR, move!" The best part is, they are both rear facing. So they don't even see what cars are in my way. They just instinctively know that somebody needs to get a move on. Anyway, it was sort of my own dirty little secret until Cork took us in one morning and picked us all up. It was equal parts embarrassing and awesome to have someone witness what I had accidentally taught the girls. Because it is pretty funny. Especially when they took it to a whole new level by telling daddy to drive faster. I was like, holy cow, they have even learned to be backseat drivers to poor Cork. These kids are like evil geniuses for their ability to replicate my every negative trait. Now, when I hear the phrase, "the apple didn't fall far from the tree," I am pretty sure what they really mean is "the apple spent too much time in the backseat while the tree was driving in traffic." Anyway, I'm working on it. I'm a little relieved it's not just us:) but that's so cute.